Well it will be if you watch it all! It's the same video clip and images shared by me... just how it's been shared all over the world. My quotes have been exaggerated. Never believe what you read in the press! Click on the links below to see how the rest of world are seeing my little white squirrel. Girls Channel... not to sure about this one! Haven't got a clue but I am so pleased they shared it. These are just a few of the sites sharing my story... there are tens of dozens. I may share some more as I view them... I'm having fun! 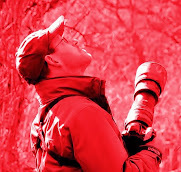 "...wildlife photographer Andrew Fulton..." one writer wrote. It a blounder, excellent photos. Excellent pictures and a fantastic clip !!! !